Even the Vikings — a front office rarely dipping its toes into a risky proposition — will need to pinch pennies after their deals with Kirk Cousins and others. Even the Vikings — a front office rarely dipping its toes into a risky proposition — needed to pinch pennies. That’ll happen when the bills come due on a quarterback (Kirk Cousins: $84 million guaranteed) and key defenders (Eric Kendricks: $11.6 million at signing; Danielle Hunter: $40 million in at-signing and injury guarantees) in the middle of a Super Bowl push. Representatives for receiver Stefon Diggs and linebacker Anthony Barr heard last month from the Vikings, who have cap room with $14.061 million in 2018 space before signing top pick Mike Hughes, about their possible extensions. After all that spending, which included an $8 million free-agency charge for defensive tackle Sheldon Richardson, the Vikings made minimal guarantees to round out the roster in Marcus Sherels ($500,000), Kendall Wright ($400,000), Brandon Zylstra ($275,000) and Tom Compton ($250,000). In about two weeks, those players on bargain deals will compete for critical roles, including some of the eight draft picks expected to report in Eagan on July 24. There will still be a few openings to contribute immediately, which we’ll break down below. There are also two critical backup spots we’ll highlight ahead of the actual competition to begin later this month. The No. 3 receiver: Laquon Treadwell’s first couple seasons frustrated many, perhaps no one more than himself, but the third-year wide receiver is coming off a spring in which he took the lion’s share of first-team reps at the No. 3 spot. If the passing-league football that is NFL spring practices was an indication, Kirk Cousins should give Treadwell more opportunities than Case Keenum did while throwing 74 percent of his passes to just four targets in 2017. Look for Stacy Coley and Kendall Wright to push for playing time this summer as well. Weak-side linebacker: Eric Wilson, the second-year linebacker who went undrafted from Cincinnati, caught some attention this spring. Not only does Wilson (6-1, 230 pounds) look stronger, the Vikings were using him more in various subpackages. That’d be a big benefit for a defense that hasn’t invested much at linebacker since drafting Barr and Kendricks. Ben Gedeon took the No. 3 linebacker snaps last season and will remain a mainstay on special teams, as is Wilson. But there is a chance Wilson can earn some defensive playing time this summer. Wilson was a Northwestern transfer who tallied more than 100 tackles in each of his last two years at Cincinnati. The returner: Marcus Sherels received a modest deal to return to the Vikings this spring, and now the longtime NFL returner is competing for his job(s). Sherels has been one of the league’s most successful punt returners since 2011. Despite that he split reps this spring with rookie Mike Hughes, whose 16.6 yards per punt return would’ve ranked second in the FBS last year had he fielded two more to qualify by the NCAA’s stats. Hughes also averaged 31.8 yards per kick return at Central Florida, making him a candidate there as well. Offensive line: The Vikings have had a backup tackle start 40 games in the last three seasons. That’s just between T.J. Clemmings (31 games ’15-’16) and Rashod Hill (nine games last year). With Riley Reiff and Hill at tackle throughout the spring, an injury on the edge would likely lead to guard Mike Remmers moving back to tackle. Then a reserve interior offensive lineman would get the call up. Between Tom Compton, Danny Isidora and Brian O’Neill, the odds are the Vikings may need one of them to contribute sooner than later. 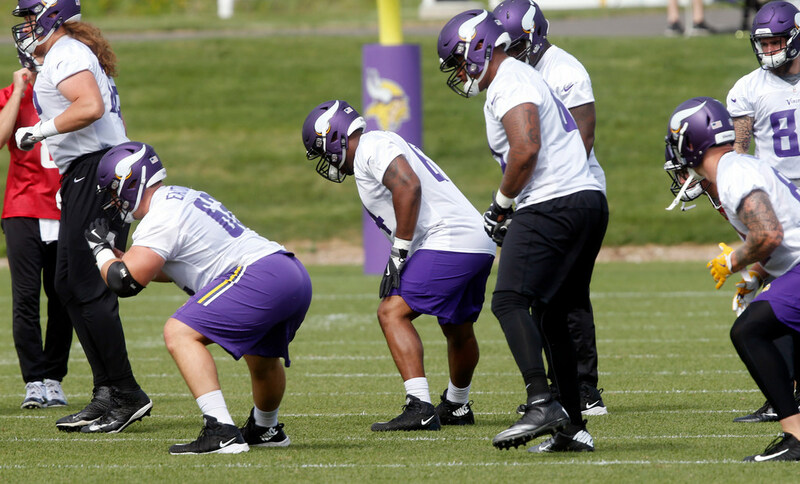 The rotational DT: Considering Shamar Stephen played about 40 percent with just one start last season, the Vikings’ top backup tackle can be as much of a factor as the No. 3 receiver given their heavy rotation. Jaleel Johnson, the second-year Iowa product, should lead the competition alongside rookie Jalyn Holmes, who broke his right hand this spring, and David Parry.